The verb pouvoir is used in Conditionnel Présent to express could. Je pourrais certainement obtenir un rendez-vous. I could certainly get an appointment. Pourrais-tu me passer le sel? Il pourrait aller à l'université s'il le voulait. He could go to university if he wanted to. Nous pourrions manger chinois pour changer. We could eat Chinese for a change. Pourriez-vous l'épeler pour moi, s'il-vous-plaît? Ils pourraient gagner cette année. They could win this year. The je form has the same pronunciation as in Futur Simple. Look for the context : I will have to vs I could! Je devrai ranger ma chambre. -- I will have to clean up my room. Je pourrai ranger ma chambre. -- I will be able to clean up my room. Je devrais ranger ma chambre. -- I should clean up my room. Je pourrais ranger ma chambre. -- I would be able to clean up my room. P.S. : Note the addidional "-s" in the conditional. 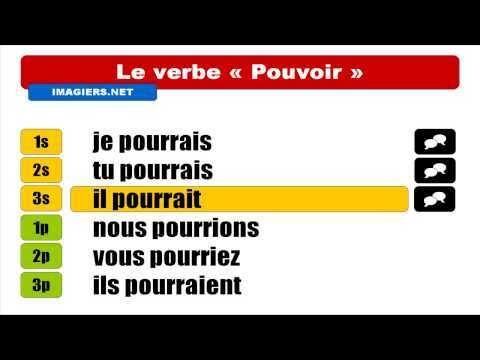 Is it correct that if you use pouvoir in the conditional present, the following verb is always in the infinitive? All modal verbs like, pouvoir or devoir require the infinitive, no matter which tense or mode they are in. Je peux t'appeler. / Je pourrais t'appeler. Is the point of this lesson that the conditional of pouvoir is used to express possibility? Is the point of this lesson that the conditional of pouvoir is used to express possibility? I don't grasp the difference between "pouvez-vous m'aider" and "pourriez-vous m'aider", or would you just not say the first one? Bonjour Kevin ! "Pouvez-vous m'aider ?" means "Can you help me? ", whereas "Pourriez-vous m'aider ?" means "Could you help me?" Just like in English, both forms are correct, but the second one is more polite, as the use of the conditional makes it a bit less direct. I hope that's helpful! À bientôt !